Dave Mertz reaches for a spoonful of chili during The Downtown Chili Cook-Off at the Park Place Hotel. Last Saturday, nearly 1,600 hungry people stopped by the Park Place Hotel in Traverse City. It was the 28th annual Downtown Chili Cook-Off and this year visitors tasted 20 different varieties from local restaurants. Dave Mertz was one of those visitors. He’s got a ballot and a tray full of empty chili cups. The Downtown Chili Cook-Off featured 20 different varieties from 13 local restaurants. “Okay, this is pretty good chili,” he says, taking a bite of a white chili variety from Minerva’s Restaurant. Mertz is a retired Michigan State Police officer who lives in Traverse City. He has made it to six or seven of these cook-offs. The competition is held in a large event room at the hotel. There are eight different categories of chili including no bean, white and seafood. Restaurants go through gallons and gallons of their chili at the event. By the time Mertz gets to the TC BBQ, they’ve already gone through 30 gallons of their '2-Alarm' variety. It includes peppers, lots of spices, butter and cheese. 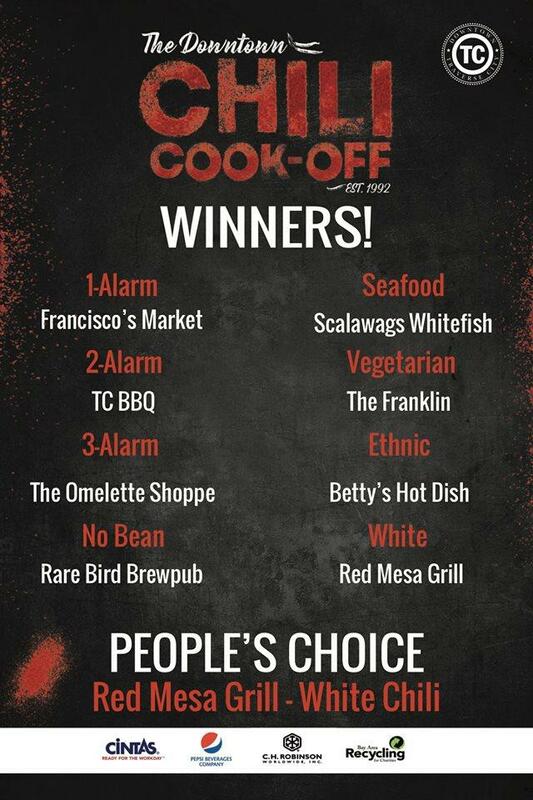 It’s Mertz's top pick for the 'White Chili' category and 'People’s Choice' category. At the end of the event, it’s the winner in both.